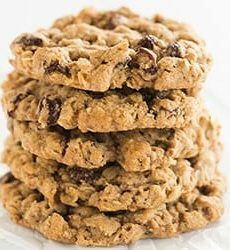 The oatmeal-raisin cookie recipe sold at Sadelle's bakery in New York City. Place the raisins in a small bowl and cover with hot water. Soak for 30 minutes, then drain. In a small bowl, sift together the flour, cinnamon, baking soda and salt. Using an electric mixer, cream together the butter and sugars on medium speed until light and fluffy, about 3 minutes, scraping down the sides of the bowl as needed. Reduce the mixer speed to low and add the flour mixture all at once. Mix on low speed until combined. With the mixer still on low speed, mix in the oats, followed by the drained raisins, egg and vanilla extract. Use a ¼-cup measuring cup to scoop the dough onto a parchment paper-lined baking sheet. Flatten each blob slightly with the bottom of the measuring cup. Cover the baking sheet with plastic wrap and refrigerate for 4 days. When ready to bake the cookies, preheat the oven to 350 degrees F. Bake until the cookies are golden brown around the edges but still soft in the middle, about 17 minutes. Remove from the oven and let rest on the baking sheet for 5 minutes, then transfer to a wire rack to cool completely.